I had the great pleasure of hearing Native Hawaiian educator and activist Haunani-Kay Trask speak not once, but twice this week. 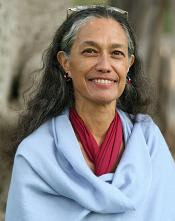 She is an outspoken activist on topics such as Hawaiian Nationalism, imperialism, tourism, labor, and indigenous rights and strongly opposes Hawaii's dependence on tourism, as well as the US military presence in Hawaii. Trask's clearest message at the lectures I attended at South Seattle Community College and Cascadia College, was that students in particular are well positioned to create change in their universities, communities, etc. She spoke often of the ease and importance of groups organizing around issues and I must say, with her passion and persistence, she surely inspired many youth to do just that. I know she inspired me. At times during her lecture, I felt like I was face to face with the passionate and sometimes volatile Hawaiian Goddess, Pele herself. As an annual visitor to Maui myself, I understand that I'm part of both the tourist and the US imperialism problem. But I can say that I'm now a firm advocate that Native Hawaiians should be given federal recognition similar to other Native American Indian Tribes and will do my part to support this effort. I'll also continue to do my best to be, as Haunani-Kay put it, a 'good haole' on and off the islands. In my past two visits to Maui and Molokai I've been able to meet, work, and learn from Native Hawaiians in several capacities. I've learned a lot about Hawaiian culture, particularly about early practices and current sustainability efforts. Next I plan on learning more Hawaiian language and working on a taro farm during my upcoming trip in August. I've also been trying to learn Lushootseed, the Native language here in the Seattle/Puget Sound area, and I have to say its incredibly rewarding to learn the true 'local' language as it fully captures the beauty and essence of a region since it developed in connection to that region. Since I speak other foreign languages (Russian, Spanish, French, German, and a little Italian and Chinese), I figured it was time to focus on the local language. So I can't wait to start experiencing Hawaii IN Hawaiian! Maholo Haunani-Kay for all you do, may you continue to inspire new activists in your cause, as well as people working on so many other deserving causes around the world.